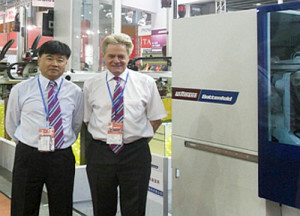 Wittmann Battenfeld, who set up an additional booth in the Industrial Automation Zone apart from its original stand at CHINAPLAS 2015, has been producing robots in China 10 years ago. One major advantage of robot is its consistence, a major element in maintaining product quality in the plastics processing industry. In the Industrial Automation Zone, Wittmann demonstrated an automation cell with robots playing basketball. The team of three consists of a W832, a W833 and a W853 with various additional axes and upgrades. 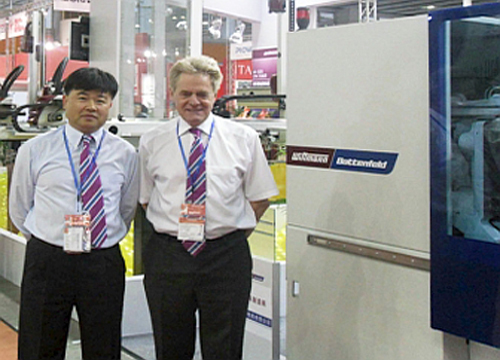 The wave of automation bear fruit for Wittmann, as its Chinese business has been growing by 30% for consecutive years since 2012. As a result, the company is looking to optimize its Kunshan factory’s production line to increase capacity. “We are working with a German company to streamline the whole production process. Our aim is to double the capacity without extra workers and floor space,” he revealed.